The prophet Isaiah speaking about Israel and its sins in chapter 56 says, “They are dogs with mighty appetites; they never have enough. They are shepherds who lack understanding; they all turn to their own way, each seeks his own gain” — NIV. 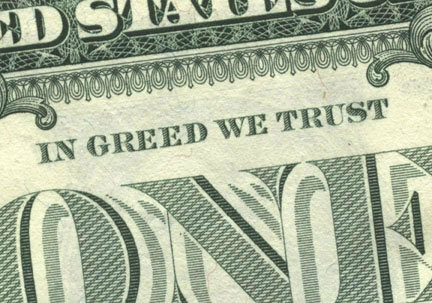 I have been preparing a series of lessons on the subject of greed and I can’t help but apply what I am studying to these United States. I’ve been thinking of federal and state deficits, the homeless, those without healthcare, the children in trouble, illiteracy, obesity, disease, unemployment and all victims. Then I look at our elected officials and their inability to solve anything. The people we have entrusted to solve the problems in America are at the same level of awareness that created the problem. In short, they cannot help us. Our three branches of government are for profit — both democrat and republican. They are feeding their own bellies and do not care about us. In the midst of our infirmities, just in the presidential election both Mitt Romney’s camp and President Barrack Obama’s camp have raised more than 130 million dollars for the month of May. The one percent is flexing their power and spending millions to get their guy elected. There is a lot more money to be made and whatever side wins the election gets the cash. As for the 99 percent, we get the same old dry promise that we too can share in the American dream. We’re promised that if we just try hard enough we too can have what they have. When will we get tired of the promises? The residue of greed within us won’t let us to get tired. I challenge you to keep track of the money donated in this particular election. It doesn’t take an accountant to see that the money spent on this coming election would solve most of our problems in America. The money donated for this election alone would create jobs, end homelessness, stop hunger, educate everyone, end obesity and provide healthcare for all. The sad part is that you won’t read any news stories about this. You won’t hear or see Fox news or MSNBC make this a topic of discussion and you definitely won’t read it as an Associated Press story. This is a shame before God! And we’re not any better 40 years later. Sadly, we’re worse. Next Post Yes! I am talking about greed again!